Working as an analyst/programmer in the computer industry for many years, I was very much involved in the logical, rational world. Experienced in problem solving and delving deeply into complex subjects, I was also interested in applying this analytical approach to my fellow man and their behaviour. This prompted me to pursue the study of Astrology; an equally scientific field yet one that incorporates the use of the intuitive mind. From this developed an expanding and deepening understanding of life and the spiritual laws of the universe whilst also enhancing my awareness of how one's thoughts and emotions can affect physical well-being. I increasingly developed a desire to want to be involved in a more humanitarian way of life that involved helping others and after securing a diploma with The White Eagle School of Astrology, I became a professional Astrologer in 1999. I am also a member of the Association of Professional Astrologers International. Although aware of the many benefits that Astrology can offer to clients, I felt that for some there was an additional factor required. For example, one may be looking for further support to help get through a difficult time, the motivation to make a change or to embrace an opportunity that Astrology had highlighted and confirmed on a deep inner level. I had already been using flower essences myself and with my children during their development into adults and began to further explore the vast field of flower essences, realising the benefits they could offer not only to certain Astrology clients, but to others in helping them to release emotional blocks which could be inhibiting them and/or support them emotionally during major life changes, traumas and challenges. Impressed with my own experiences with flower essences I embarked upon the 2-year course in vibrational medicine with Clare Harvey at the International Federation for Vibrational Medicine and gained a diploma. From this I acquired a more wide-ranging knowledge and the ability to help others with flower and other vibrational essences. I am an Advanced Flower Essence Practitioner with the British Flower and Vibrational Essences Association (BFVEA) and I am registered with GRCCT (http://www.grcct.org), the UK federal regulator for complementary therapies. In addition, I am Secretary for the BFVEA and involved in producing their quarterly magazine ESSENCE. I am also Secretary for COREP (Confederation for registered essence practitioners). I am the mother of three grown up children and I live in Hampshire, in the South of England, with my husband. I enjoy nature, gardening, writing, studying ancient wisdom and metaphysics and anything to do with flower essences and Astrology. Since Edward Bach produced his first set of flower remedies in the 1930s, a whole new series of them have been developed - such as the Australian Bush Essences, the Findhorn Essences and the Petit Fleur range. A dazzling 400 of them - the most commonly available - are dealt with in this book. Yet Debbie Sellwood develops a whole new method of prescribing them, which is by your astrological sign. These prescriptions recognise that one essence may be useful for several signs - but the zodiac is a real tool in understanding what will work for you. Vibrational medicine comes into its own with the subtle understandings this book provides. Choosing remedies the Sellwood way is, also, a wonderful aid to self-understanding. 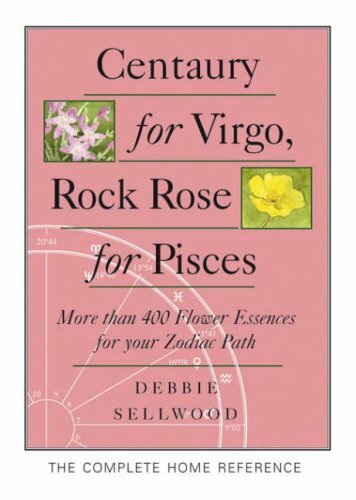 "Centaury For Virgo, Rock Rose For Pisces" is a book about an inward path, not just about treating a condition. The complete home reference, it is also a wonderful tool for therapists and practitioners. Accelerate your personal growth and expand your awareness by aligning with your soul purpose. "Debbie Sellwood has combined her experience and knowledge as an astrologer with a wide-ranging insight into the world of flower essences. The result is a well crafted and useful combination of the two subjects. She avoids the usual formulas, preferring a more subtle investigation into the thoughts and feelings of each Star sign." Clare G. Harvey, author of the New Encyclopaedia of Flower Remedies, in her introduction to this book. "I am delighted to be able to recommend the first comprehensive in-depth study on the transformational effect of flower essence." We, the Association of Professional Astrologers, are a group of highly trained practitioners whose aim is to uphold the best standards of quality and service. A professional organisation which has been established for over 12 years and sets the highest standards of competence and performance in the essence field.